Synology’s DS415+ is a NAS (Network Attached Storage) device aimed at small businesses or demanding home users. I have been running this on my own network for the last 6 weeks or so. DS414j £252.63: Budget offering, 512MB RAM, 1.2 GHz dual core ARM CPU, 1 USB 2.0, 1 USB 3.0, 1 1GB Ethernet port. 90W power supply, 32.64W power consumption. DS414 Slim £237.87: Smaller case designed for 2.5″ drives. All the other units here support 3.5″ drives. Given that you can normally tuck your NAS away in a corner, there is limited value in restricting yourself to these smaller drives, but there is also an energy as well as space saving. 512MB RAM, 1.2GHz single core ARM CPU, 2 USB 3.0 ports, 2 1Gb Ethernet ports. 30W power supply, 15.48W power consumption. DS414 £332.83: Core product. 1GB RAM, 1.33 GHz dual core ARM CPU, 1 USB 2.0, 2 USB 3.0, 2 1Gb Ethernet ports, 90W power supply, 28.42W power consumption. DS415 Play £379.99: Home oriented. Benefits from hardware video transcoding. 1GB RAM, 1.6GHz dual core Intel Atom CPU, 3 USB 2.0 ports, 2 USB 3.0 ports, 1 1Gb Ethernet port, 90W power supply, 27.33W power consumption. DS415+ £460.74: Business oriented. 2GB RAM, 2.4GHz quad core Intel Atom CPU, 1 USB 2.0 port, 2 USB 3.0 ports, 1 eSATA port, 2 1Gb Ethernet ports, 100W power supply, 32.64W power consumption. You can get a more detailed comparison of these four models in this table. Incidentally, I am guessing that in the Synology numbering scheme, the first digit represents the number of drive bays, and the second two digits the year of release. The 415 models are the latest releases then, and the only ones to use Intel CPUs. The extra cost of the 415+ buys you double the amount of RAM, a quad core CPU, and an eSATA port. The software is mostly the same on all the devices, Synology’s Diskstation Manager (DSM), currently at version 5.1. It looks as if some limits are lifted with the 415+, for example there is support for 256 iSCSI LUNs on the 415+, versus 10 on the 415 Play. The 415+ also has specifica support for VMWare VAAI (vStorage API for Array Integration) and Windows Server ODX (Offloaded Data Transfer); this enables some storage tasks to be offloaded to the storage system for better performance on the virtualization host. Why buy a unit like this when you could simply get a server with plenty of drive bays, or with hardware RAID, and install Linux or Windows Storage Server? The two reasons are first, simplicity of operation, and second, low power consumption. The distinction is not as sharp as it first appears, since a Synology device like this is in fact a server. If you require maximum flexibility and do not care about energy use, a generic server is probably better. If you require only simple network attached storage, such as a large shared folder on the network, a unit like the 415+ is overkill; just get a DS414j or some other brand. On the other hand, if you expect to install and use several apps, the extra for a DS415+ buys you a substantially more capable server. Another way of looking at this is that the processing power in the DS415+, while still modest compared to a modern desktop PC, is sufficient for some real work, such as running web applications or even a media server with software transcoding. Unpack the box, and you find the NAS unit, power supply and a couple of ethernet cables. Unclip the front cover and you can see the four drive bays, with caddies which can easily be removed for drive installation. The drive caddies are screwless for 3.5″ drives; just remove the side panels, insert the drive, and replace the side panels to secure. You can also install 2.5″ drives with four screws through holes in the caddy base. At the rear of the unit, there are dual fans, two Ethernet ports, 2 USB 3.0 ports, eSata port, and the power connector. I fitted four 3TB Western Digital Red drives – currently £89.36 on Amazon – attached the device to the network and powered up. You can than access the NAS management UI with any web browser. Normally, entering diskstation:5000 will find it. 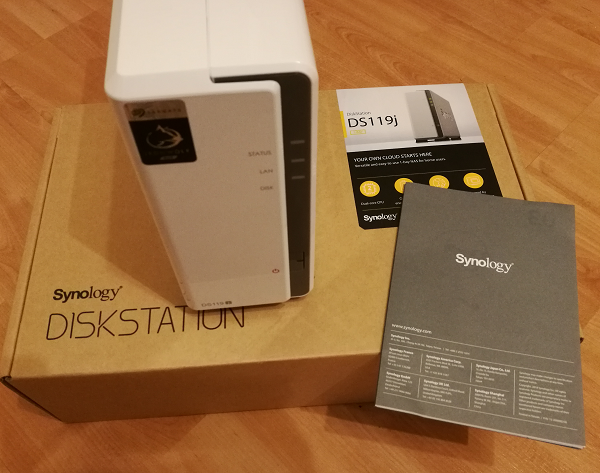 The initial setup downloads and installs the latest version of DSM, and offers an instant configuration which is a single large network folder backed by Synology Hybrid RAID (SHR). I accepted this just to try it, and then blew it away in favour of a more flexible configuration. Synology DSM is a version of Linux. You can access the OS via SSH, or use the browser-based GUI. The GUI is rather well done, and presents a desktop-like environment with a windowing system. Generally, you should use only the Package Center to manage applications, though terminal access can be useful for troubleshooting, cleanup, or tweaking settings if you know what you are doing. Even a manual install has to be in the Synology package format (an archive with appropriate metadata). Some packages, such as the Plex media server, are available for download as manual installs, though may need tweaking to install correctly. 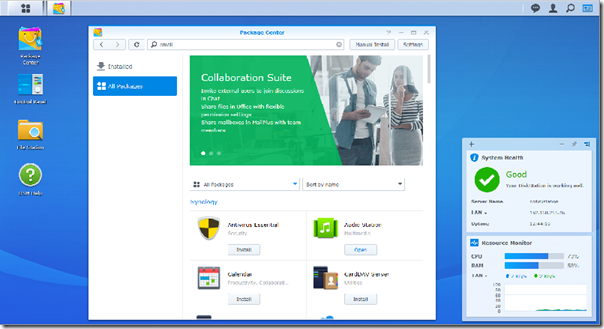 Third party developers can create packages, free or paid, and submit them to Synology for approval. If an application is updated, it can take a while before the Synology package is updated. This could be a problem if, for example, a critical security bug is found in an application running on a Synology device exposed to the internet. There are not a huge number of packages available. I counted 63 in the DS415+ Package Center. However, this does include everything you need for a basic business server, including a mail server, DNS Server, LDAP Directory Server, Drupal CMS, SugarCRM, web server with PHP and MySQL, Tomcat application server, and more. On the multimedia side, there are applications for serving audio and video, a DLNA media server, and Logitech Media Server (also known as Squeezebox Server). There are several backup applications, including one for Amazon’s Glacier service (low-cost cloud storage). 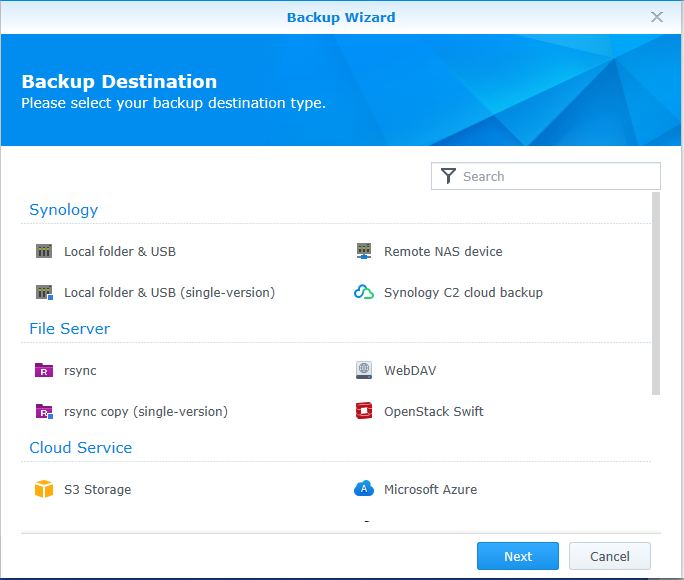 The primary role of a Synology device is for storage of course, and this is configured through the Storage Manager. 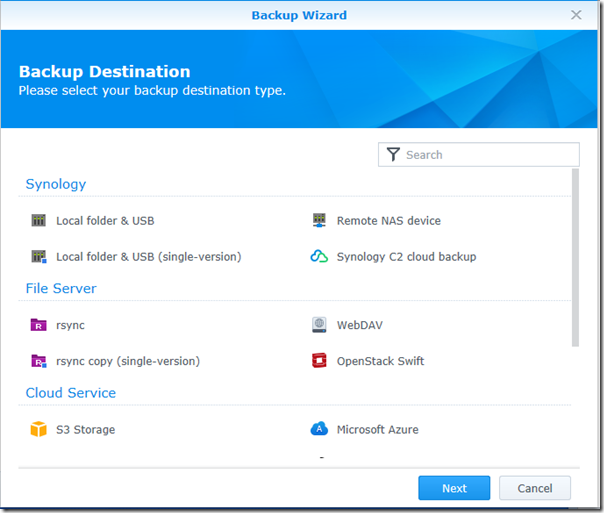 Configuration begins with Disk Groups, which represent one or more physical drives in a RAID configuration. SHR: Synology Hybrid RAID with 1- or 2- disk fault tolerance. You need at least 4 drives for 2-disk tolerance. RAID 10: RAID 0 across mirrored drives, 1-disk fault tolerance with high performance. What is SHR? There is an explanation here. The high-level story is that SHR is more efficient with drives of varying capacity, and more flexible when adding new drives. It is not proprietary and apparently data can be recovered if necessary by mounting SHR drives in a Linux PC (provided no more than one drive has failed). You set the RAID level when you create a disk group. Once you have a disk group, you can create volumes or iSCSI targets on that group. I was interested in trying iSCSI. I have a desktop PC that is running out of space. 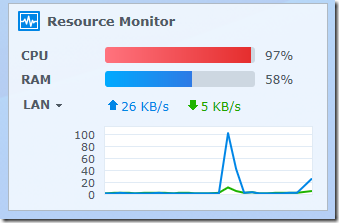 I created a 1500GB iSCSI target and mounted it on the PC using the iSCSI initiator in Control Panel. It worked perfectly, and a new drive appeared in Disk Management. Is this sensible, or should you just use a network folder which is more flexible, since it is shared storage? An iSCSI target behaves like a local drive, which can be an advantage, but iSCSI is mostly used for servers where centralising storage is convenient. You should also use a dedicated network for iSCSI, so it is probably not a great idea for a desktop PC. I compared performance. On simple tests, such as time taken to copy a file, there was little advantage; in fact, my iSCSI drive was slightly slower: 61.2 MB/s vs 76.4 MB/s for a shared folder. In general, I have been very happy with the performance of the NAS. My local network uses Active Directory (AD), so I was keen to set up permissions on the NAS using AD. Connecting a Linux server to AD can be a problem, and at first the Synology would not play. I connected it, seemingly successfully, but it would not see any users. There are threads on the Synology forums showing users with similar problems. The fix for me was to enter my Domain Controllers as IP numbers rather then FQDNs (fully qualified domain names). Since then it has worked perfectly, though DSM shows the Domain Server Type as “NT4 Domain”, puzzling when my DCs are on Server 2012 R2. Once connected, you can set folder permissions using the Synology File Station package. 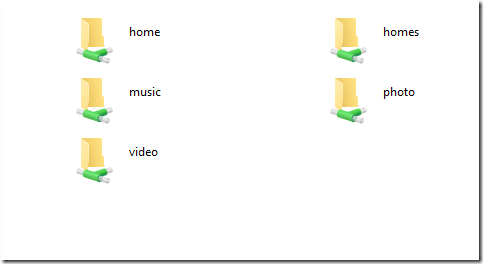 First, create the shared folder, then right-click the folder and choose Permissions. Aside from the storage services, the main application I run on the Synology is Logitech Media Server (LMS). This used to run on a Windows server, and actually runs much better on the Synology. Search is quicker, the server is more responsive, and it is more reliable. I tried the Synology audio and video applications, and the media server. There are various companion mobile apps, such as DS Audio and DS Video, for media playback. The apps I tried worked well for me, though I am sticking with LMS for home music streaming. I have no complaints about the DS415+, which has performed well so far. Browsing through the user forums though, I have noticed some areas of difficulty. 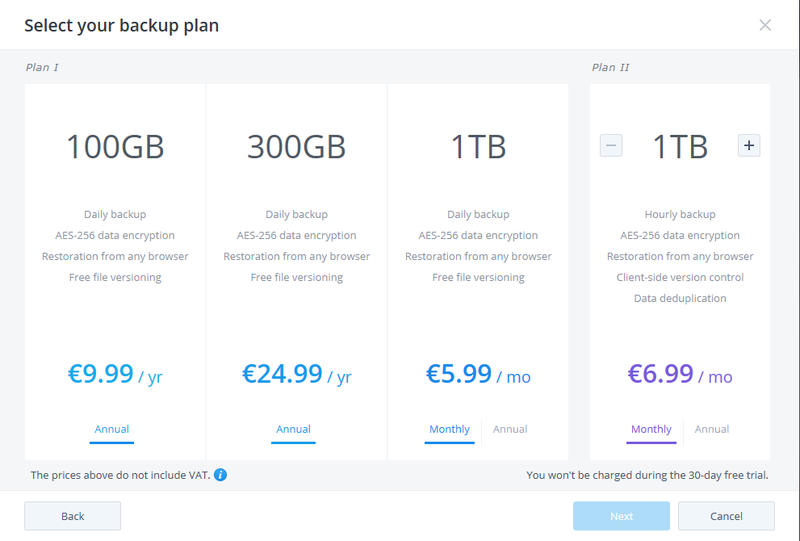 One is that the Cloud Station service, which synchs files between your NAS, computers and mobile devices, is notorious for consuming disk space. Users find their drives filling up even though the total size of their files is much less than the available space. Currently, the best advice seems to be not to use Cloud Station. The general issue with a system like this is that the friendly GUI is great while everything is working, but if something goes wrong and you have to dive into Linux, the ease of use disappears. That is worth noting if you plan to use this as the main server in a small business (beyond storage), unless someone there has the necessary troubleshooting skills. The device does tick a lot of boxes though: resilient storage, excellent performance, low power consumption, flexible configuration, AD integration, and enough power to run something like Logitech Media Server without blinking.